1) Bad rares are still bad rares. Despite how slow sealed events usually are, a bad rare is still a bad rare. The format is surprisingly fast, meaning that a lot of fluff cards should take the backseat. I naively thought that Plea for Guidance was a great tutor in that because of this set, it grabs auras, creatures, and Gods. Much like Jarad’s Orders, unless your deck is chalked full of great targets, this is simply a win more card. 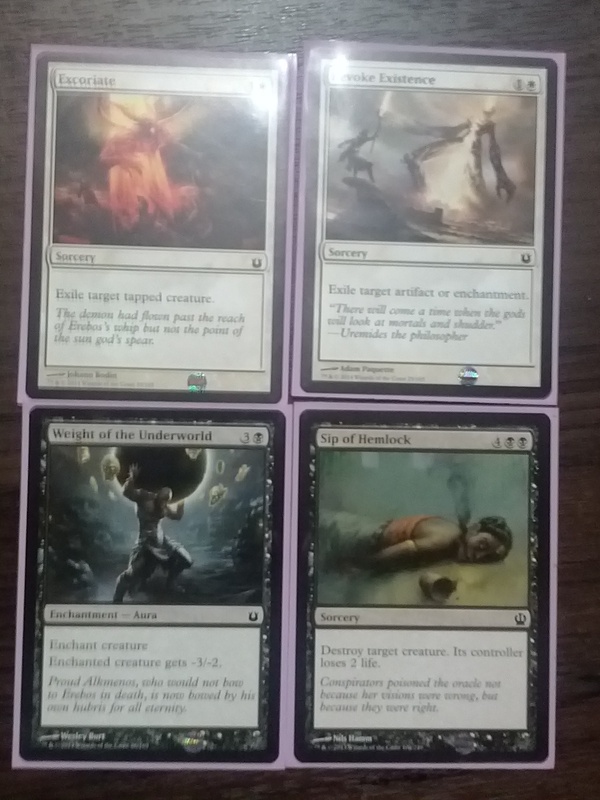 Even as an experienced magic player, I fell into the trap of “Oh, it’s rare, so it must be good.” But this is what prerelease events do for me. Even if I failed majorly, it’s great to tinker with all the interactions before going into much more smoothed out decks through drafts. I can’t really think of many other rares that lead to traps like this as I looked through the list and I often swapped this out for other mediocre cards that may or may not have helped me. This is a pretty obvious rule, but another competitor and I had the same problem: lack of good removal in any color. 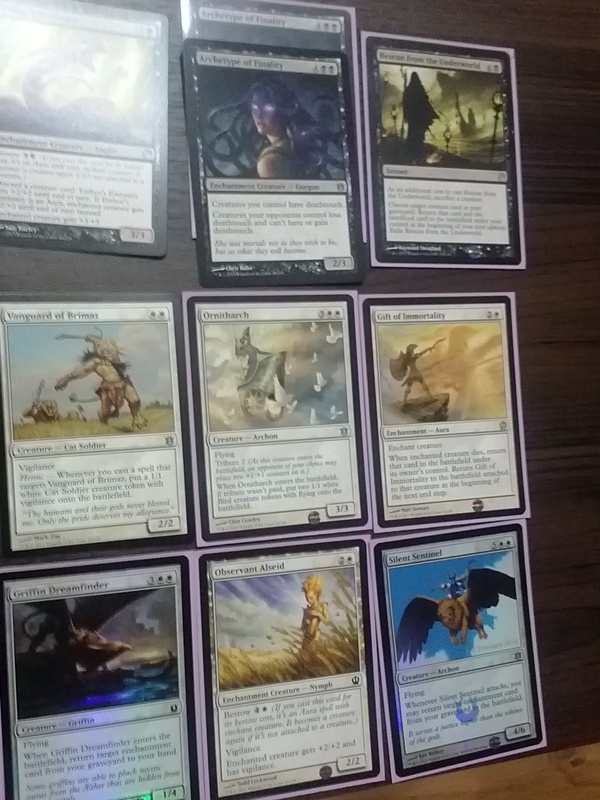 With the exception of the four cards above, my pool had absolutely no removal besides a poor man’s Frost Breath. 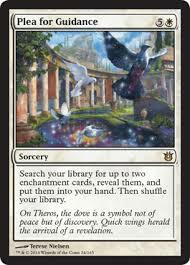 The white cards, mainly outperformed the black counterparts in that they were able to take care of nearly any problem that came up. Weight of the Underworld was decent removal, but often times it was just too much mana for what it did. The same can be said for Sip of Hemlock, which at six mana merely breaks apart a Voltron piece that late in a game. This rule goes along with the one I just mentioned. My removal choices were very limited, so it should have been an incentive for me to switch things up and just try to outaggro other decks. While my red cards lacked any removal, they seemed to go better with my white pool and combat tricks like Rise to the Challenge would at least favor my odds and trigger heroic. This one is particularly hard for me because when I build decks via limited, I picture what cards work and how they interact. This process usually takes me about five to ten minutes. As an artist, I generally don’t like to tinker with a finish product. As a magic player, I need to. The white-black concoction just wasn’t working. It was clunky and the format was just too fast to wait for my deck to figure itself out. Regardless of my losing streak, I had an incredible time playing. I probably would have done alright using the Korean cards, but as a collector, I just prefer having cards in English. Draft might turn out to be more interesting so I hope to have some reports of what brews I come up with. I did good on Saturday in Nagoya, Japan (4-1), but went 2-2 in two tournaments on Sunday. I was playing UB mill (pulled an Ashiok and Phenax in the first tourney) and GB, and didn’t get decent removal in my black. I had to get pretty creative and use cards like Necrobite to kill creatures attacking with deathtouch, but it made me play a lot more defense than usual :(. I recommend UW heroic and GU if you can draft those colors in the future. Both played really well for me. Card draw is the name of the game if you want to win. Even a good voltron deck is alright, as long as the pieces are decent without heroic mainstays. Unfortunate you didn’t fare better with the dream UB mill. It was a lot of fun to play. I just loaded up the deck with whatever blue and black cards I had with high defense and threw in all removal I had. I lost against a mono blue tempo deck (he had an great pool) and a very nasty GW aggro deck that just overwhelmed thanks to his Courser of Kruphix and a lot of enchantment destruction. With the right removal it can be awesome to play. Funny enough, this pool came from my red box, not blue or black. If I had either of those boxes, my deck would have been pretty sick I think.